I talked about the Spring Snakeskin trend on Wednesday and today I wanted to show you my take on the trend. You should know by now that I always look ahead, and choosing my wardrobe is no different. 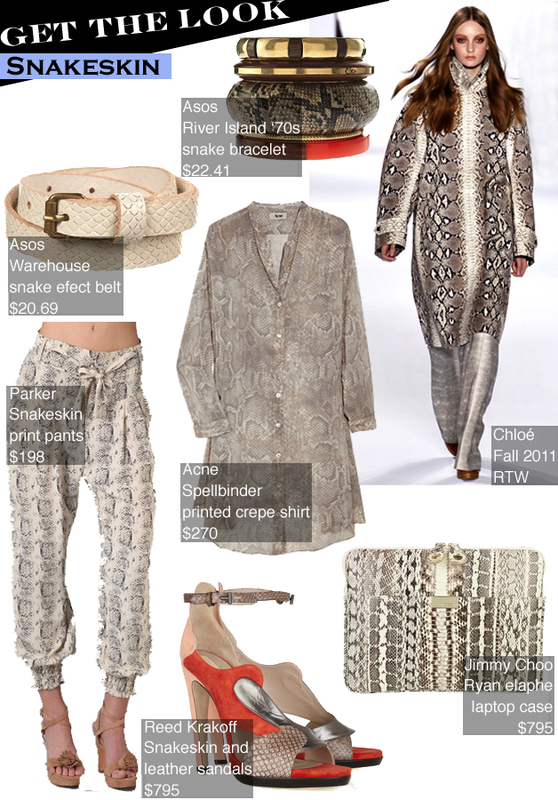 I took inspiration from this Snakeskin look by Chloe that I love for Fall 2011. The shape of the coat is amazing but what I love is mixing the snakeskin prints together to create a version of the All In One color trend that we also saw for Fall. Acne’s printed crepe shirt has the perfect amount of transparency for the season and could be utilized in so many ways from a tunic, cover up, shirt to a dress. I love it paired with the Parker cropped pants and finished off with an extra long white snakeskin belt by Asos. The large inexpensive bangle from Asos is all I would need to add for a touch of color. For a daytime LA look I’d wear a great gold sandal but for work or a party, Reed Krakoff’s mixed snakeskin sandal would be amazing. I’m in love with the color orange and I love the sexiness of the snakeskin around the ankle. The Jimmy Choo laptop case is amazing and it would make toting my computer around so much more fun! Klonopin is a prescription mecidation that is used to treat a wide variety of conditions such as epilepsy, anxiety disorders, and panic disorders are all commonly treated with Klonopin. Hyperekplexia, restless legs syndrome, and parasomnia are also successfully treated with Klonopin. This potent and well respected mecidation is often thought to be preferential, when compared to mecidations like it, because it has a very low toxicity, a short half life, and it also begins to work quite quickly. 5mg, 1mg, and 2mg tablets.